I had been feeling ill for four years when I was finally given a diagnosis of ME (myalgic encephalomyelitis). This is a chronic condition with a long list of symptoms … so many symptoms, in fact, that you feel people will think you’re a hypochondriac if you list even a fraction of them! I’ll run that risk here. ME is basically a neurological dysfunction that causes the body’s electrics, or, as I now prefer to see it, qi flow, to malfunction in a major and long-term way. The condition varies considerably across individuals in terms of severity, range and duration of symptoms, some people being bed-bound for years while others are what one ME sufferer I know calls ‘walking wounded’. The main symptoms are a profound and disabling physical and mental fatigue combined with a feeling of coming down with a virus, like a dose of flu that never quite materializes. The feeling has been likened to that of running a car on a torch battery! Other symptoms vary across individuals, but include chronic sore throat, hypersensitivity to light and noise, tinnitus, balance problems, giddiness and cognitive dysfunction, known among people with ME as ‘brain fog’. Sleep is often disrupted, and even good sound sleep fails to relieve the fatigue. Another problem, apparently brought on by candida albicans (yeast overgrowth), is chronic digestive disorder, the sort of thing doctors call IBS (Irritable Bowel Syndrome). Apart from the discomfort this causes, it can seriously reduce the body’s ability to extract nutrients from food. ME is also characterized by a relapsing remitting cycle of these symptoms, relapses often brought on by even the most modest physical or mental exertion. This is partly why some people think it’s a completely psychological condition. You know the kind of person, one minute they seem perfectly OK and the next they’re moaning about practically every symptom under the sun. If you work with such people, they keep saying they’re overworked and are always off sick. That’s why ME used to be called ‘yuppie flu’. Crucially, ME is a condition for which western medicine has no cure. Conventional wisdom often prescribes the following trio: anti-depressants in small doses to modulate pain and improve sleep, CBT (Cognitive Behaviour Therapy) to promote both management and acceptance of a highly restricted life-style, and a finely graded exercise programme aiming slowly to rebuild one’s physical strength. None of this appealed to me at all. Enter Qi Gong! Last year, I simultaneously happened upon this life-changing practice from two different perspectives. I became a student of Taiji Qigong . As I understand it, this might be termed ‘post-natal’ Qigong; that is, you learn a set of specific movements, gradually improving your technique with practice. I also started attending occasional weekend courses and residential retreats conducted by Wang Zhixing in the south of England. Zhixing has developed his own style of Qigong, which must be about as far from the martial arts end of the spectrum as it is possible to be. It is ‘pre-natal’ and focuses on healing by connecting to the original state, or Qi state, through, among other things, body movements that are relatively free form, meditation, visualization, breathing techniques, sounds and mantras. I find the practice of these two approaches to be complementary and, in my experience, I have found them to be quite literally life transforming. 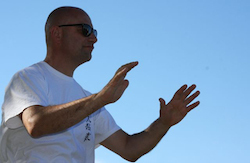 While I wouldn’t wish ME on anyone, I can’t imagine a better way to gain an instant understanding of the profound potential of the practice of Qigong. Though unschooled in Traditional Chinese Medicine, I have come to regard my condition as a predisposition to blocked qi, and my answer to that is, simply, to practise Qigong. My own initial experience was that its practice reversed the extraordinarily draining and chronic symptoms I had had for six years. I could come to an hour-long session feeling like death warmed up and leave feeling as though a gentle healing had taken place at several levels. I would feel energized both physically and mentally, and such symptoms as sluggish circulation, poor coordination and balance, light and noise sensitivity, as well as the ever present tinnitus, would be alleviated. I found that the more I practised, the greater the healing, and so I began practising at home daily (well, most days!). From only being able to work an average of three hours a day just before my first contact with Qigong last year, I can now work almost full-time. Sometimes, if I can feel a relapse coming on while I’m working, I just stop what I’m doing and practise for a while. This usually sends the relapse into reverse, and even if it doesn’t, I still feel a whole lot better. And it’s not just my working life that has virtually returned to normal. With the onset of ME, my social life had all but come to a grinding halt. Having friends to stay for the weekend would inevitably lead to a relapse on the Monday morning (if not, before my friends had even left!). Evenings out had to be planned in advance so that the following day could be devoted to nothing but rest and recuperation. What’s more, with so little physical energy, hobbies like hiking and gardening had become thing of the past. In fact, the perceived danger of overexertion, and a hazard well documented in the ME literature, had initially made me nervous about taking up Qigong. 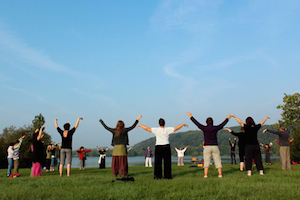 I remember wondering, “since physical exercise triggers relapses, why should Qigong be any different?” Well, it is different, radically different! Instead of draining a person with ME as would, say, jogging or even swimming, Qigong, with its targeting (in the ‘post-natal’ form) of acu points, reactivates stagnant qi along the meridians. At first, I was a little hesitant at trusting this process, and I remember doing a physically demanding (‘pre-natal’) Qigong movement and starting to sweat. Amazingly, I realized that this was the first time I had sweated through physical movement for years. It felt terrific, but I wondered about a relapse. None came! I was back on the road again. There’s a difference, though. When I can safely say that my predisposition to blocked qi is a thing of the past, I’ll still be practising Qigong.